^ Østergård, Uffe (1997). 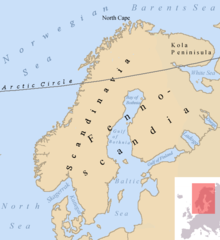 "The Geopolitics of Nordic Identity - From Composite States to Nation States". The Cultural Construction of Norden. Øystein Sørensen and Bo Stråth (eds. ), Oslo: Scandinavian University Press 1997, 25-71. ^ Sawyer, Bridget and Peter (1993). Medieval Scandinavia: from conversion to Reformation, circa 800-1500. University of Minnesota Press. ISBN 0-8166-1738-4. ^ Sømme, Axel (Ed.) (1961). The Geography of Norden. 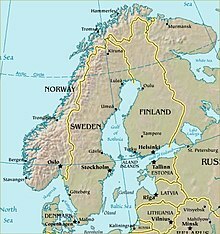 Oslo: Den Norske nasjonalkommittee for geographi.